Home Lifestyle TV Couch Critics Shall we Split from being told how to think? Shall we Split from being told how to think? CONTROVERSIAL: The Battle for Britain’s Heroes. DID you catch the final episode of BBC1’s drama The Split on Tuesday night? To summarise, Nicola Walker played Hannah Stern, a London- based divorce lawyer wanting to break the money hungry image of her contemporaries and practise with decency and honesty… haven’t we been here before? If you remember the cliché breakfast, power jacket and too high heels of episode one, you are probably a bigger fan than most, but there were some brilliantly written pieces too, Stephen Tompkinson and Meera Syal splitting for example. Writer Abi Morgan did try and cover some challenging topics, the football ace and the glamour model who argued over a pre-nup, but for me the ‘this is mid-week TV’ language got in the way. I apologise in advance for what comes next, but would anyone actually describe a pre-nup as something written by the head for when the heart has forgotten that it once loved – you are a glamour model love, ditch the bloke in shorts, shove the pre-nup down his socks and go find a guy who wants to be with you for better or worse. The series ended with a run of events most of us could see coming a mile away and a wedding. Not sure about a second series, maybe move it to Sunday and stop playing it safe? Maybe Hannah could hook up with the footballer and show him exactly where that pre-nup should be shoved or maybe we should just accept that Tuesday, Wednesday and half of Thursday’s TV is safe, lovely and wrapped up in a nice cup of tea and an iced bun? Sticking with Tuesday’s TV, if you want to make your blood boil search out Channel 4’s The Battle for Britain’s Heroes, which aired on Tuesday this week. 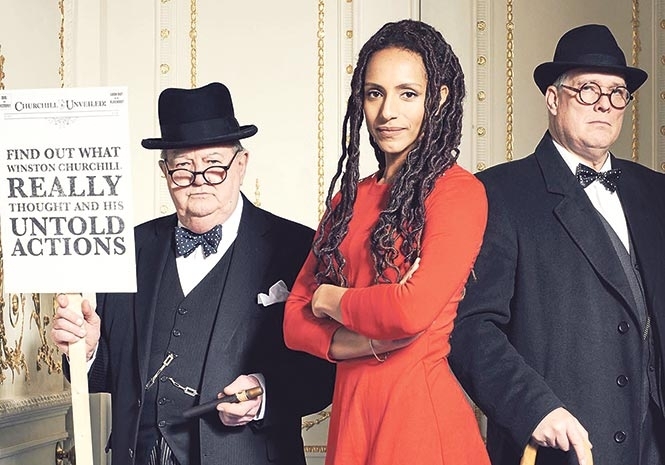 Afua Hirsch is our guide for this troll back through Britain’s history to find fault. Afua is a writer and journalist. If you have heard of her (I hadn’t) she recently had a spat with Piers Morgan about her own, personal views, about Winston Churchill. If there was ever a good way to publicise your own show Afua, a spat with Piers will do just nicely. Now, I’m risking people saying I’m swaying into Leapy territory here, but suggesting Churchill, Nelson and others should not be celebrated as British heroes probably crosses a line for most us. You can see the show on Channel 4 Catch Up, but please have some rosehip tea somewhere close if you do. Looking ahead, ITV Racing Live has coverage of The Derby from Epsom on Saturday afternoon. It’s a classic. I want to close with two look backs; firstly, Cornelia Frances died this week in Australia. Best known for her part in Home & Away, this Liver Bird also had parts in Sons & Daughters, The Young Doctors and was the host of the Aussie version of The Weakest Link. Thanks Cornelia. Second, if you made it through the final Peter Kay’s Car Share BBC1 Sunday, without crying, well done. A little bit like Benidorm I can’t quite believe the show has finished. Unlike Benidorm, Car Share can still command an audience in the millions, brilliant work Peter and Sian.